Latest post Tue, Jul 24 2018 2:30 PM by Marianna. 16 replies. So, when I start up Media Composer it hangs like 2-3 mins on start up - Initializing AMPIPluginDSM.avx. I've read online some people have simply deleted it. Okay..except I can't find it. Where is it? Why does it exist? So, none of what is listed above is in my folder. Is it possible it's related to the Nablet plugins? we might not have caught them all. if you drag the folder to the desktop and relaunch, does it work? Tried removing nablets first. Still hangs. Then whole AVS2 folder...still hangs. When it hangs - go to the force quit under the apple menu and tell me what is says next to MC. Also I dont know if I asked but what OS are you on exactly? It doesn't freeze. It. just take a long while to get through. An annoyance...not a crisis. But definitely unusual behaviour. So I don't need to Force Quit. Had the same problem - I have iZotope RX 6 Elements installed. I went to the preferences in RX 6 Elements and disabled Audio Units and VST plug-ins. Relaunched Media Composer and it worked. Fish - see if that works? I have no Zotope plugins installed. This is all I have. And, once again, I remove dteh whole folder and tried. Still a long pause. 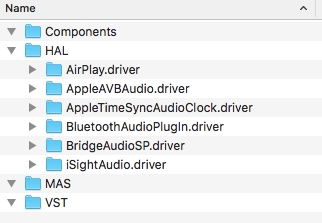 What if you go to Library/Audio/Plug-Ins/ - Are there any plug-ins in any "Components", "VST", or "VST3" folders? ok...I'll report on Monday. Too much background processing going on to interrupt. Thanks Marianna. Marianna, will moving the AVX2 folder cause MC to lose any features or functionality? Moving the folder allowed MC to launch. Just for kicks, I moved the AVX2 folder back after successfully launching Avid without it and it actually launched! Weird! Hope this bug gets fixed soon.